Tomorrow is Father's Day. Which, when you aren't a father, your spouse isn't a father and both your fathers are dead... well, we don't really have plans. 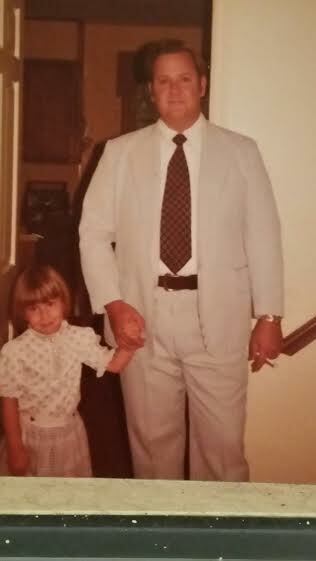 Me and Dad, circa 1978? Seersucker and a cigarette. I was trying to think of a story I could tell about Dad, and the one I came up with was this. When I was in 4th grade, my parents had me tested for Attention Deficit Disorder. It was the 80s, and that was the scapegoat diagnosis for everything. Although I was ultimately diagnosed with ADD, the truth is, my best (only) friend had moved to Mississippi and I was depressed - but back then, they didn't really know what to do with a depressed ten year old. They put her on Ritalin. That, plus making a few new friends pretty well fixed it. That's not really the point, though. The point is that the shrink ran me through a bunch of tests, and one of them was to draw a picture of a family member. I drew my father. She asked me what he was doing in the picture, and I said, "He's asking me what we're going to cook today." Dad did most of the cooking in our house. I'm sure I've told you that before. I watched. I basically just liked hanging out with Dad. And I liked food. He would do smothered hamburger steaks sometimes. Rice was the standard carb in our house. Rarely potatoes. When I was sick, he would make me matzo ball soup. He did birthday cakes for us - chocolate pound cake with a chocolate buttercream icing. Once, for my birthday, he made me a pasta dish with a Gorgonzola cream sauce and toasted walnuts - based on a meal we'd had together in Paris. Funny story about that night in Paris, actually. He, mom and I were walking, and it was raining out, and we kind of got turned around. He went into a bar to get directions. When he came out, he remarked on how friendly everyone had been to him. It was a gay bar, if the rainbow flag out front means the same thing in France. Dad was not homophobic. He would have been appalled about Orlando. Another time, I would have been in my 20s, he, Mom and I at Christmas time were making peanut butter fudge, and again, it was raining, and a batch failed. I offered to take the aluminum pan filled with the unset goo out to the trash can outside, and I remember standing in the cold rain eating some of the warm peanut butter/sugar sludge before going inside. At least once, I remember Dad picking me up from school, handing me a Mounds bar and telling me I looked like I needed some Vitamin M. Occasionally, if we were out early running errands, we'd get a snack cake and a soft drink. "Breakfast of Champions", he'd say. So, is it any wonder that in missing my Dad, I turn to food? Dad was food, and Dad was comfort, and in absence of Dad... there is food. And a modicum of comfort. "Probably not ADD. Seems depressed. Give her Ritalin anyway. Also, probably going to have an eating disorder. Daddy issues." I only discovered a few years ago that the rainbow is a property of those who walk the lavender path now. My first internet username was rainbow_rising (based on a poem I'd written once, Rising Rainbow) and I'd no clue that I was probably signalling a wholly erroneous idea of my sexuality. I love that you have so many wonderful stories about your dad. This day is tough for you, I'm sure. Hugs.